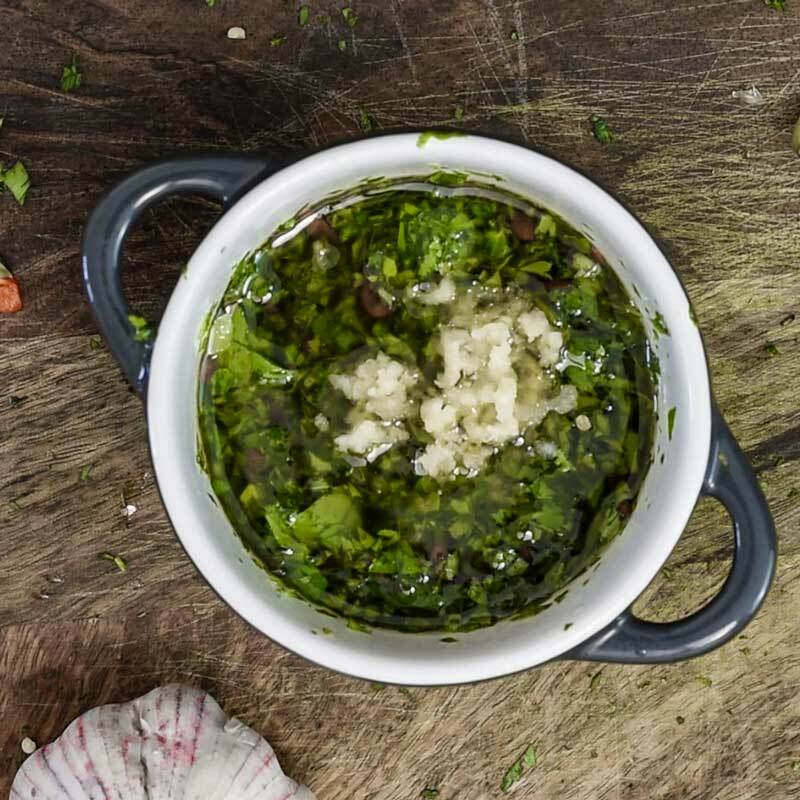 Chimichurri sauce is a native dish of both Argentina and Uruguay. High in fat and full of flavor. Use it to enhance your meat dishes. An easy homemade recipe. 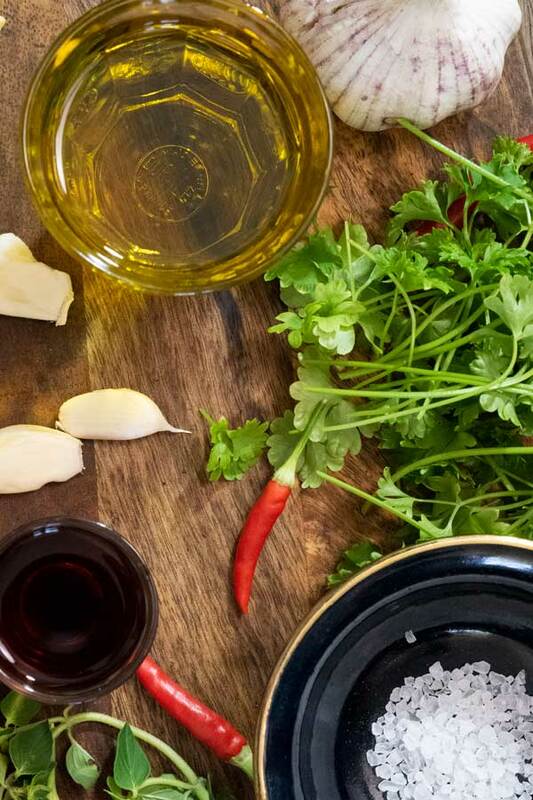 This is a homemade recipe for authentic Chimichurri sauce made the Argentinian and Uruguayan way. Chimichurri is ideal to serve on just about anything, steak, vegetables, grilled fish and chicken. Chimichurri also makes a great marinade. This chimichurri recipe makes approximately 1 cup of sauce, or 16 serves. 1 serving is 1 tablespoon. When making the original “authentic” homemade Argentinian or Uruguayan the secret is to finely chop the ingredients and mix together with a spoon. 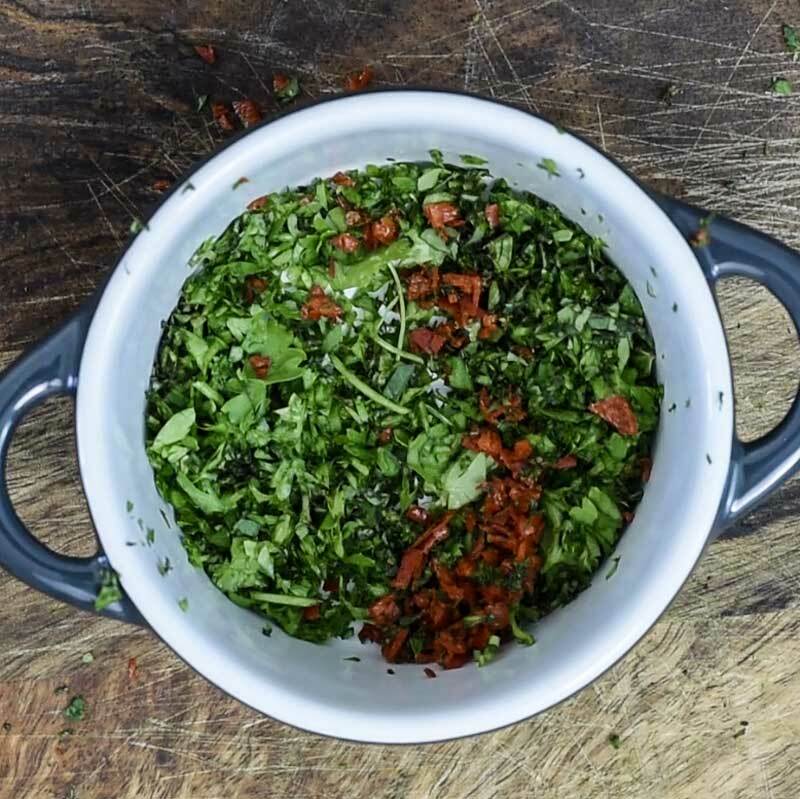 Using a food processor or blender will only create a paste and that makes something far removed from the loose and oily authentic chimichurri. If you’re going to be chopping herbs often get yourself a Mezzaluna they make life a lot easier. Chimichurri should be able to be spooned on to drizzle all over your food with the oil carrying the ingredients through your meal. The ingredients for authentic chimichurri can be picked up at the local supermarket. 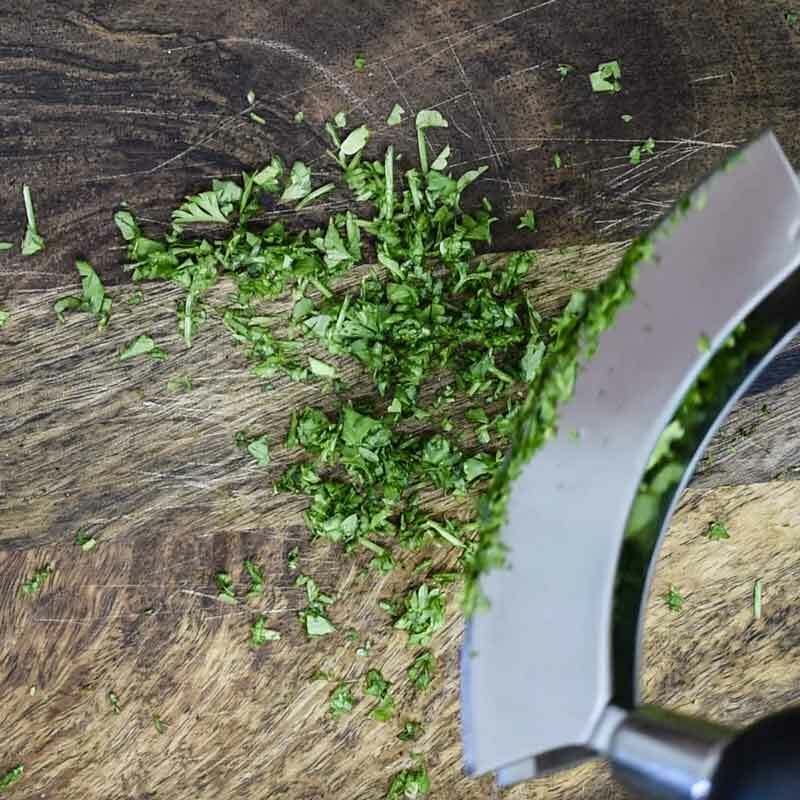 Chimichurri contains red wine vinegar, olive oil, parsley, salt, pepper, garlic. When measuring the ingredients the herbs should be loosely packed into your measuring cup. Finely chop, parsley, chili, and oregano. Mince the garlic (you can use a garlic crusher or small cheese grater). Add to a bowl along with the vinegar, oil, and salt. Serve or place in an airtight jar in the fridge. Chimichurri is easy to make, we grow our own chili and parsley as we use them often. 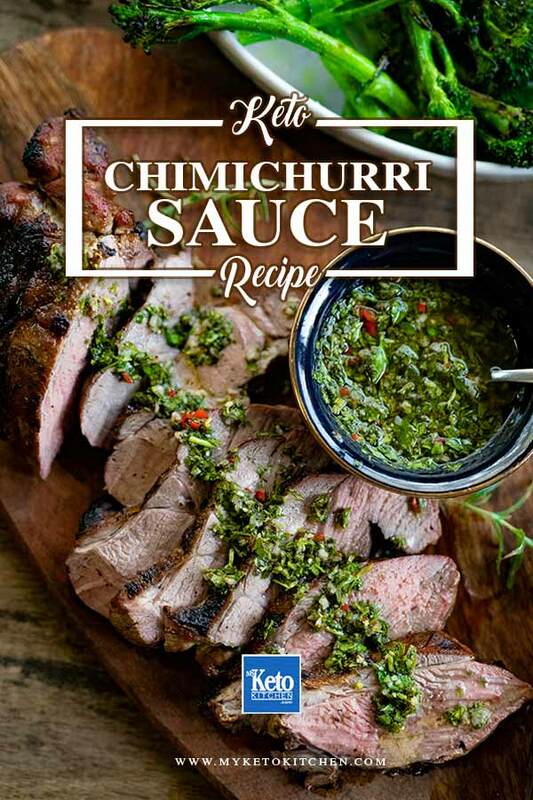 Authentic Chimichurri Sauce is ideal to serve on just about anything - "steak, grilled fish or chicken". Chimichurri also makes a great marinade as long as you stick to the secret method. Cut the chilis down the middle and deseed them. 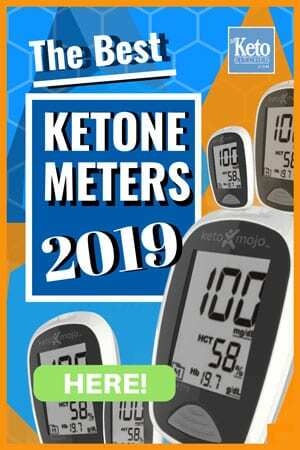 Is Chimichurri Low-Carb and Keto? 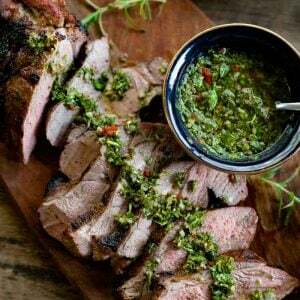 Authentic chimichurri is very low-carb due to the high oil content of the sauce. The high fat and low-carb of chimichurri make it very keto friendly and it’s an excellent way to boost the fat content of a meat dish that may be a little on the lean side. It’s perfect with a fatty cut like lamb leg, t-bone and drizzled over chicken thighs. 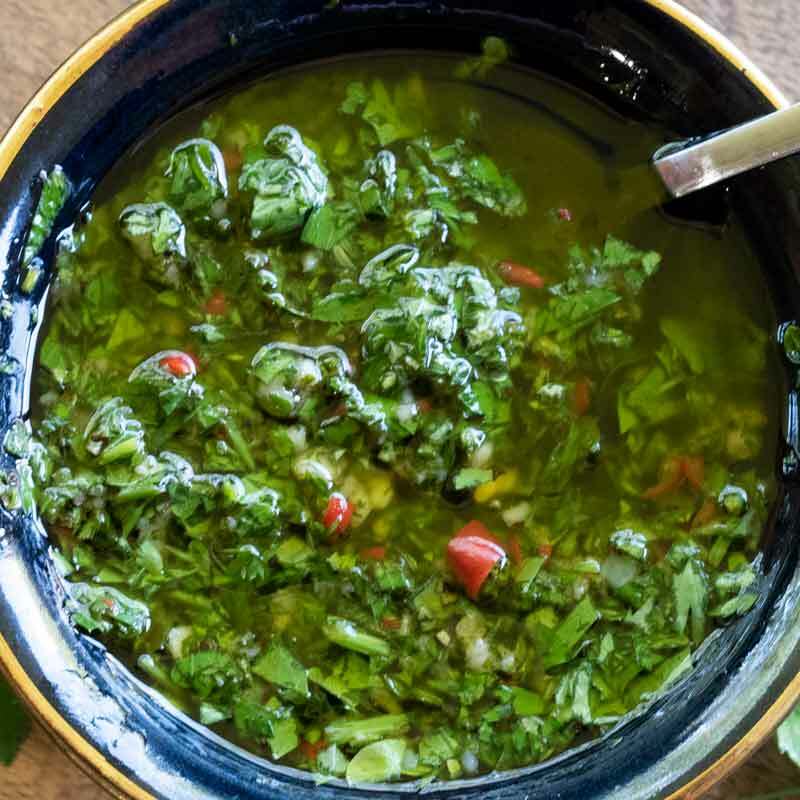 Chimichurri is a rich, parsley flavored sauce, with garlic added to taste, it can be hot with added chili (like our recipe) or the heat can be left out. Salt and pepper serve to enhance the flavor and the red wine vinegar and olive oil help the flavor infuse the meat and make a smoother consistency. Yes, you can make Chimichurri ahead of time, some people swear by letting it sit for several hours to a couple of days. The flavors are more intense if the sauce has been stored in the fridge between 2 hours and 24 hours before use. It will keep in the fridge for up to one week, but after this time the vinegar will begin to break down the herbs. Is Chimichurri served hot or cold? Chimichurri is served cold or at room temperature, it should not be heated. The olive oil in chimichurri tends to get infused with the flavors of the herbs and spices when left to sit for 24 hours. But you can serve chimichurri freshly made and you won’t get any complaints, we do it often. To make a larger batch of Chimichurri adjust the servings above.